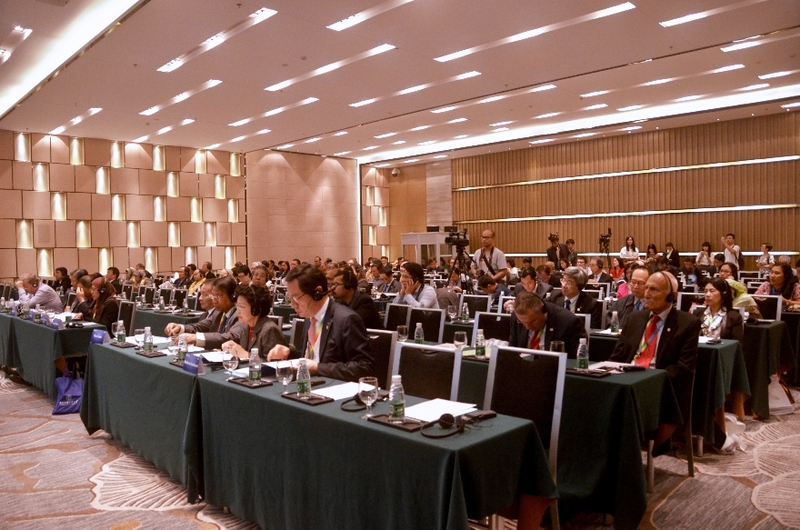 On November 6th, the 14th Asian University Presidents Forum (AUPF) was held in the International Convention Hall, Easeland Hotel. The Theme of the AUPF was: Asian Higher Education Connectivity: Vision, Process and Approach. The representatives from different Asian universities gave a presentation concerning their views on the theme of AUPF. The forum had two sessions. In the first agenda, ZHUANG Mingying, Honorary President of Chaoshao Vocational and Technical College; Datuk Kamarudin Hussin, Vice Chancellor of Universiti Malaysia Perlis; GU Peihua, Provost and Vice President of Shantou University; Chung Hae Lin, President of Busan Foreign Language University; and Vladimir Kruzhaev, Vice Rector of Ural University, were invited to give a 15-minute presentation in order. CHEN Linhan, Vice President of Guangdong University of Foreign Studies, was responsible for chairing the forum. ZHUANG Mingying first expressed his sincere congratulations and thanks to GDUFS since the Secretariat of AUPF is based on GDUFS. The topic of his presentation was “Enhance connectivity, improve the level of forum”. In his presentation, he briefly introduced the history, the participants and the purposes of AUPF. And then he elaborated on how AUPF achieved its purposes of connectivity, communication of information, exchange of experience and mutual development. At the end of his presentation, he put forward three constructive assumptions for AUPF to improve the quality of AUPF and inject dynamics for Asian universities or even the universities all over the world. Datuk Kamarudin Hussin expressed her own opinions on international student mobility. She said that conventional international student mobility entailed a lot of investment and she also emphasized the motivation for international student mobility, the most important of which is the measure of “university excellence”. She also introduced an online platform ICT (Information & Communication Technologies). With ICT, physical mobility is no longer a prerequisite to international student mobility. GU Peihua pointed out that university rankings greatly influenced public views on the institutional development, ranging from students’ choice of universities to government funding decisions, which has become a challenge for Asian universities. To rank high in modern university ranking systems, universities have to invest a lot in academic and scientific research, but ignore the significance of undergraduate education. He thinks the advanced undergraduate education is Liberal Art Education. He encourages undergraduate students to take on double majors, he develops holistic education and stresses innovation and entrepreneurship in Shantou University. Chung Hae Lin shared some basic information about Busan Foreign Language University through a video. During his presentation, he stated that since 2004, Busan Foreign Language University has established academic cooperation with GDUFS, such as a student exchange program. He highly recognized the advantages of GDUFS’s English teaching, which should be followed in order to promote the internationalization of Busan Foreign Language University. Busan Foreign Language University has made a comprehensive reform on its curriculum and adopted the credit system to strengthen local competitiveness. Moreover, he illustrated the necessity of reinforcing the communication and cooperation between different universities and expressed his hope that AUPF is able to help achieve the goal. Vladimir Kruzhaev briefly introduced the history and overview of Ural University as well as its development program ― “five-year plan”. The five-year plan has attracted many foreign students to study at Ural University. He mentioned that through a school-enterprise cooperation pattern, cooperation networks among “Brick universities” had covered Brazil, China, Russia, South Africa etc. and broad collaboration in the field of material science had been developed. And the second session was chaired by Mathana Santiwat, the former president of Bangkok University. In this session, there were still other representatives who gave speeches about the education and internalization. They all agree on one idea: that the goal of university is primarily to educate people. APUP has a history of fourteen years and it has reached many achievements. There is still a long way to go in the future. But there is no doubt that it will develop steadily. The meetingcompleted successfully among the warm applause of all attending people.